Strikingly beautiful, this opulent ring features a cushion set diamond cluster totalling 1/5ct atop a sleek 9ct white gold band. Designed to stand out, this piece is perfect as an engagement ring to symbolise your forever promise, and equally as charming as an everyday accessory. 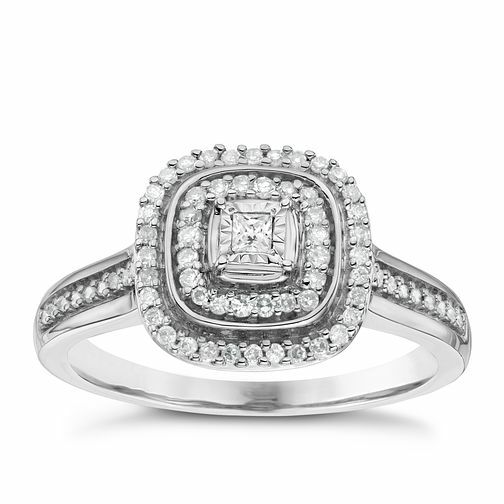 9ct White Gold 1/5ct Cushion Set Diamond Cluster Ring is rated 5.0 out of 5 by 4. Rated 5 out of 5 by Anonymous from I Said YES The Love of my Life Proposed, when I saw the Ring my heart melted.My ring is a Beautiful piece. I Absolutely Love it !!! !